Good evening, everyone. When we last left our heroes they were laying waste to an Isles team that in the past has given them difficulty. It's always nice to see the Pens lay the lumber to a team, even if it's a crap team. Most teams would miss a beat if shorn of the reigning Hart/Art Ross winner; the Pens just watch Crosby go out and do what Crosby does. They even played a little defense against the Isles, which was a welcome sight. For the most part, the forwards have fallen into place since Bennett was called up. Kunitz has caught fire. Dupuis is doing the dirty work for Crosby. Cooke is back on the 3rd line doing Matt Cooke Things. Tyler Ken...okay, there are still bugs in the system. The defense is still a problem, and not because they've had two rookies in and out of the lineup. Most of their problems can be traced to Letang impersonating Sandis Ozolinsh, Orpik trying to play his way off the 2014 US Olympic team, and the continuing mediocrity of Deryk Engelland. Fix those, and this will be a fully operational battlestation. Tonight's opponent is the Boston Bruins, who have the 2nd most points in the East but are 4th overall at the moment. They've played tight defense this year, and are 3rd in the league at 2.1 goals allowed/game. Offensively they always seem to amount to more than the sum of its parts. They have struggled on the power play this year, so any Bruins PPs may amount to a stoppable force/movable object battle. The game is on NBCSN here, so I won't get to hear Steigy get confused with both teams having the same colors. Standings? http://espn.go.com/nhl/standings/_/group/2 The Pens have a decent lead in the division. Philly is in real trouble, which cheers me. The Caps are in real trouble as well, which is clearly their plot to keep the Pens from winning the Cup. They've figured out the Pens need to beat Washington on their way to the finals and have decided not to show up. Nefarious. As always, tonight is an important game given that it's against another top team in the East. A loss will lead to a 50 page meltdown thread; a win will be discarded immediately. Hopefully the good version of the Pens defense shows up tonight. Let's get it done. They are still allowing you to do this? No pictures in the preamble? WTF Rocco! You are slacking! Kovy27 wrote: They are still allowing you to do this? I've never used pictures in the preamble. WTF is with those purple and pink jerseys? That's a great cause and all but are they actually wearing these for the game? LOL what happened to Tampa Bay? Weren't they in like 3rd two weeks ago? I actually don't disagree with this move. Dan Bylsma is truly unbelievable. 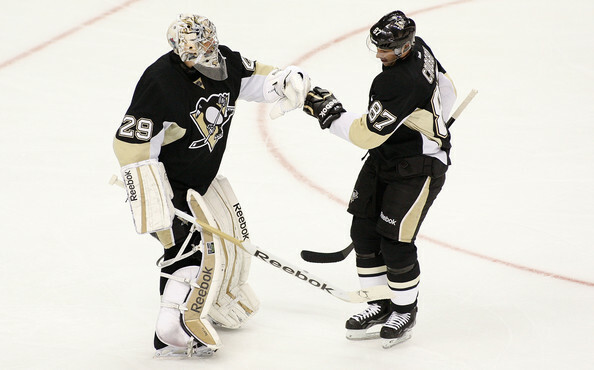 Pens come off their most impressive defensive effort in a long time and what does he do? Breaks up the d pairings from last game and scratches Despres for Engo. Last edited by ranci on Tue Mar 12, 2013 6:29 pm, edited 1 time in total. Despres isn't gritty enough. And he's under 27. And he has talent. I know the Bruins are a tough team... just don't get that.